This is a very simple recipe for a wonderful Bundt Cake. The Pumpkin and spices in this cake will make it warm and comfort for this winter season. When you add a dollop of vanilla ice cream on top of this warm cake, that makes it even better. 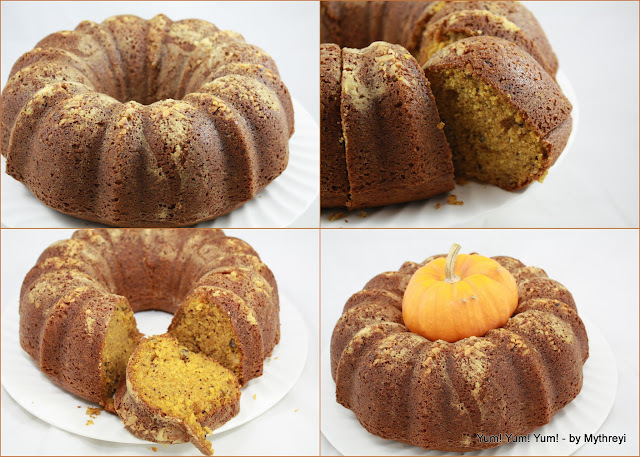 I always love the spiced cakes, but the pumpkin and walnuts in this cake gave a special twist to this cake making it even more flavorful and addictive. The measurements used in this cake are little heavy compared to normal cake measurements, hence making it dense and spongy. With these measurements I have got the full blown cake in my bundt pan. You can reduce the measurements to half for smaller bundt cake. Here is the recipe, Njoy! Preheat oven to 350 degrees F (175 degrees C). Grease and flour a Bundt Pan. Sift together the flour, baking powder, baking soda, salt, cinnamon and nutmeg powder. Set aside. Combine sugar and oil in a large bowl. Blend in vanilla and pumpkin, then beat in eggs one at a time. Gradually beat in flour mixture. Stir in nuts. Spread batter into prepared Bundt Pan. A bowlful of warmth and spice! I have used fresh cinnamon and nutmeg and grind them, that added a lot of great taste and flavor. Though I say walnuts are optional, i insist you to try this with walnuts ( unless you are allergic to nuts). it took me 60 mins to bake this, but I suggest keep an eye on it after 50 mins. Super tempting cake, looks simply beautiful and gorgeous.Even i love warm spiced cakes. Hi. You seem super busy. Thanks for taking time to visit me. As for the cake its awesome. A perfectly delicious and an awesome cake to have. Seems like your little lovelies are enjoying their bite.